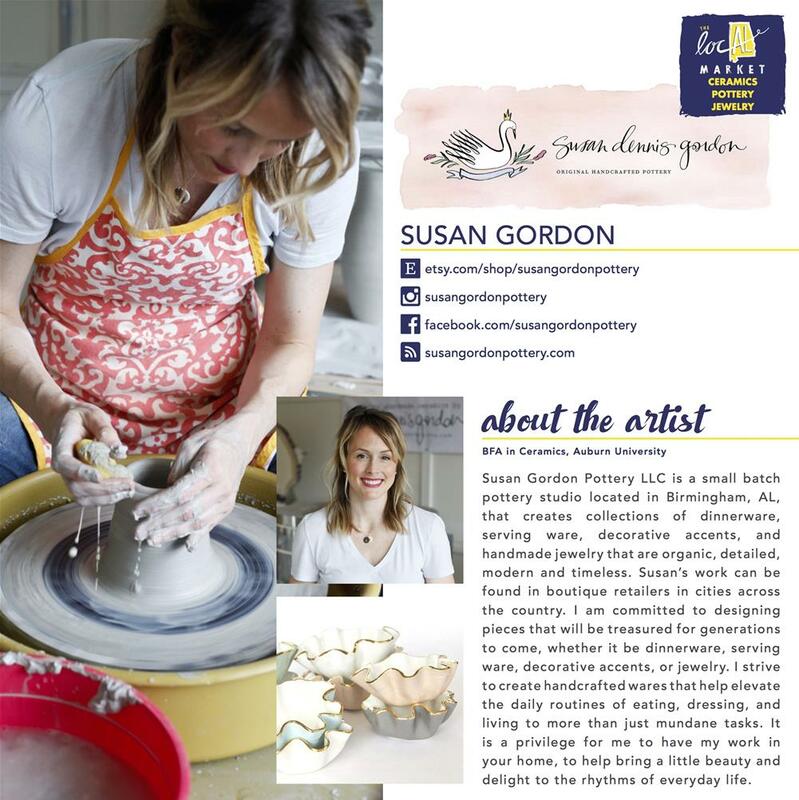 MEET THE MAKER: Susan Gordon Pottery LLC Susan Gordon Pottery LLC is a small batch pottery studio creating collections of dinnerware, serving ware, decorative accents, and handmade jewelry that are organic, detailed, modern, and timeless. Susan’s work can be found in boutique retailers in cities across the country. About the Artist I have an insatiable desire to create and have always been interested in making art, whether it is painting, drawing, or forming pots. I fell in love with clay while studying to be a graphic designer at Auburn University. Eight years, a B.F.A. in Ceramics, and a Master’s Degree in Art Education later, I left my full-time job as a gallery director and came back to my love of creating with clay. I am committed to designing pieces that will be treasured for generations to come, whether it be dinnerware, serving ware, decorative accents, or jewelry. I strive to create handcrafted wares that help elevate the daily routines of eating, dressing, and living to more than just mundane tasks. It is a privilege for me to have my work in your home, to help bring a little beauty and delight to the rhythms of everyday life.